WOW!! Brand New Home. Sitting at the end of the street on a cul-de-sac is this 4 bedroom 3 Â½ bath home. Beautiful Brick Front, Extra Long Driveway that leads up to 3 Car Garage. 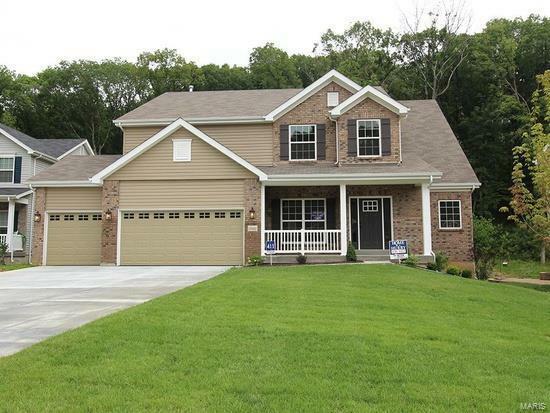 Walk inside to a 2 story open foyer that leads into the 2 story Great Room with Gas Fireplace. Open Kitchen with large Island, Upgrade Cabinets, Stainless appliances with Double Oven, Microwave and Dishwasher. Main Floor Master Suite with Luxury Master Bath featuring Dual Sinks, Separate Marble Soaking Tub, and Marble Shower. Upstairs has a HUGE LOFT area, and boasts a Bedroom with Private Bathroom, and Two more Bedrooms with Jack and Jill Private Bathroom. This is the one you've been looking for. Schedule your appointment today to see this great home. 300 acre Community. 167 acres of Common ground, Dog Park, Small Lake, 2 pavilions + New Elementary school. Virtual Tour is of similar home and not exact model. Consult Sales agent for more information.